2016 Gala & Benefit PerformanceDance-a-thon for RainForest! Please enjoy reading our first electronic newsletter ~ CANVAS! Welcome to our new, quarterly e-newsletter, Canvas. Each season we will be sharing news from students and teachers around the globe who are impacted by our work. Thanks to the ongoing generosity of the Creative Connections community, they are part of a global movement to bring cultural understanding to our world. This generosity was on display at our recent Annual Benefit Performance and Gala at Grace Farms. A direct result of the enthusiasm and dedication of our Board of Directors, event committee, staff, sponsors and volunteers, our annual event brought together over 200 members of the community for an evening honoring Cherie Burton, an outstanding past member of our Board of Directors and former Board Chair. Our guests enjoyed elegant cuisine expertly designed and executed by Marcia Selden Catering and Event Planning, together with an extraordinary performance by the award winning youth ensemble from South Africa, Soweto Melodic Voices. To view the photos from this special evening, click here. To further inspire our mission, Creative Connections was awarded the Scott Shuler Distinguished Art Advocate Award, presented by the Connecticut Art Education Association (CAEA). This award recognizes outstanding achievement and contributions in art education and advocacy. We are honored to have our work celebrated here at home by the State of Connecticut. And we are honored to pay it forward. This year we named North Branford Intermediate School as our USA Art Partner of the Year. 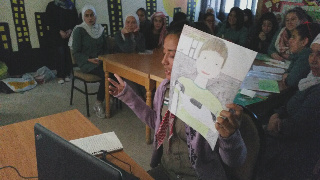 Children’s Art Circle – Colombo Children’s Book Society in Sri Lanka and Khelda Secondary School in Amman, Jordan were named our International Art Partners of the Year. PS – Save the Date! 2016 International Children’s Art Exhibit will be on display throughout November at the Silvermine Art School in Norwalk. 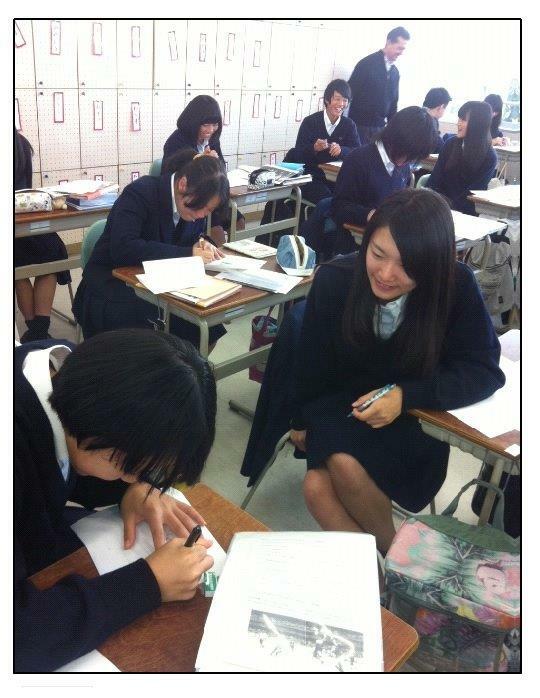 We are honored to announce that our ArtLink Japan program has received a grant from the United States-Japan Foundation (USJF). This funding will allow us to deepen our partnerships with our 20 existing classrooms and pilot our new asynchronous networking platform, ClassroomLink. For many years, we have struggled to replicate the dynamic back-and-forth dialoguing that videoconferencing provides for many of our ArtLink partnerships. The time difference, combined with complicated technology, has made live conferencing between Japan and the USA impractical. Because of USJF’s continued support, we have just begun the customization of a platform for our ArtLink partners. Be sure to follow us on Facebook (if you aren’t already) for updates as we continue to build this new, cutting-edge platform! We think all of our students are extraordinary, but the students who are part of Escape for the Arts, a YMCA after-school program in Danbury, take the cake! The students recently held a bake sale which raised $200 to support their participation in our RainForest ArtLink program. 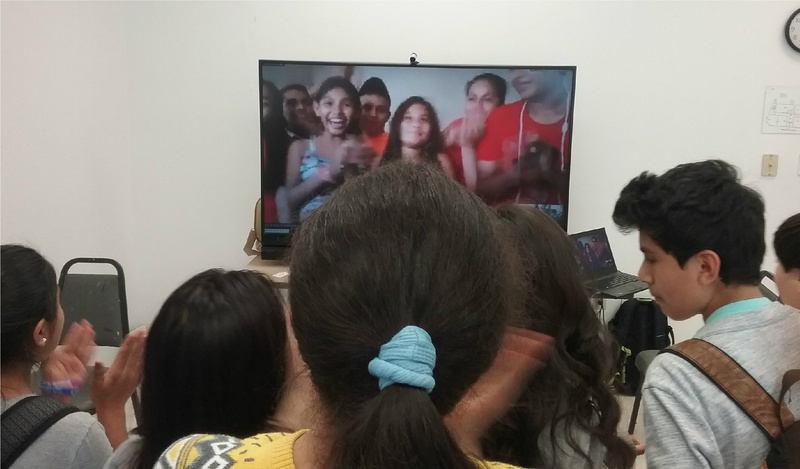 Pictured here are students videoconferencing with their partner class from Melchor de Mencos in Guatemala. 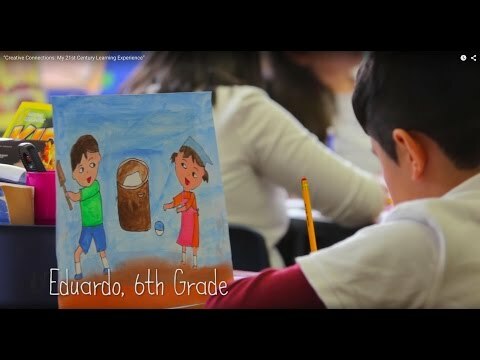 With 90 percent of Danbury’s after school student population speaking Spanish, this exchange truly exemplifies a creative – and cultural – connection! 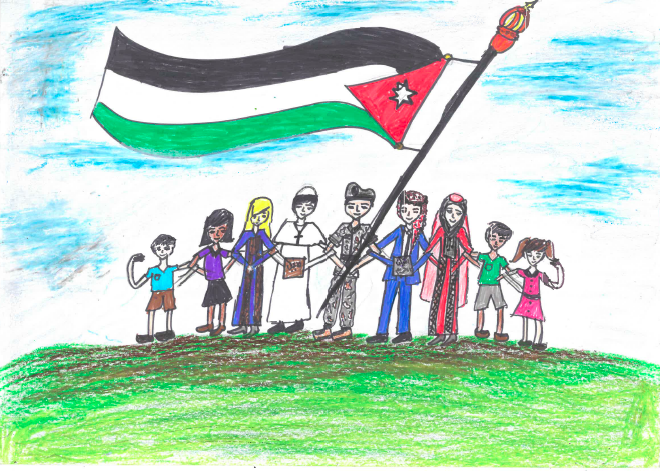 The MEC pilot program will bring students from Norwalk’s Center for Global Studies together with their peers from Khalda, a public school in Amman, Jordan. Not only will students participate in an ArtLink exchange, they will also take part in additional videoconferences, collaborate on the creation of an online art exhibit, and present their experiences to members of their school communities. We are excited to offer our supporters a new way to connect with our classrooms! Since our beginning 24 years ago, we have used the exchange of art to eliminate stereotypical thinking for more than 100,000 students in 62 countries. But we can all agree there is more work to be done. And the demand is there. We have a waiting list of inner-city schools in Bridgeport, Danbury, Newark, and New York City, but we can’t enroll them in our Fall ArtLink programs until we secure underwriting funding. With sponsorship packages ranging from $695 – $1,500, you can support a classroom by covering a portion, or all, of the required program fees. As a sponsor, you’ll be invited to personally connect with your classroom(s) and to observe their live videoconference. To learn more, connect with Polly Loughran, ArtLink Program Director. Creative Connections is pleased to welcome Kim Beck, Assistant Superintendent of Ridgefield Public Schools, to our Board of Directors. Connect with us online, or in your classroom!